Have you ever struggled trying to figure out your relationship to other family members? If so, you’re just like me and many other people. I still to this day have the hardest time figuring out what the exact “term” is to describe family relationships. I’m always asking someone older in the family such as a grandparent who seems to know every family relationship like the back of their hand. I suppose that’s something I get to look forward to when I grow old… [sarcasm] can’t wait [/sarcasm]. Is that person my first cousin? Second? Third? And what is this whole “once removed” business? Granted I probably have wished a time or two in the past that a cousin could be “removed” from the family, but no such luck. When will I ever understand this relationship conundrum? Well, fear no more. 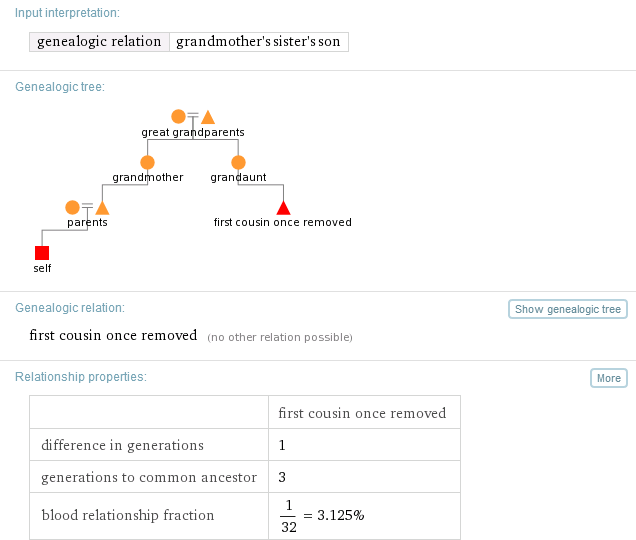 Enter Wolfram | Alpha – the computational knowledge engine. This is just one tiny little sliver of what Wolfram Alpha can compute. There are so many more things this site can do. You should also check out many other examples of different computations the engine can perform. All in all, I have barely brushed the surface when it comes to using Wolfram Alpha, but I am loving it so far. I plan to write a follow-up blog post showing more in-depth examples that you can use Wolfram Alpha for such as figuring out the nutritional facts for 23 peanut M&M’s (yes, it can do that too!). They even have a mobile app for multiple devices (although there is a small cost). What are your initial thoughts of the site? Have you used it before? Feel free to leave feedback in the comments! If my dad didn’t marry my mother, my mother married third person, can i marry her son????? this is my doubt, under what relationship we both have it..